A broad smile spread across Hallie’s face. Finally, after all these months, the documentation had been processed. The first adoption from her orphanage was about to take place. She’d made a difference. She turned around, looking outside of the window. Having her office windows overlook the children’s playground was originally just for convenience, but today, as she watched them play on the monkey bars, he view had gained a special significance. Sigrid had no idea how her life would change in the months to come. A kind new family was about to welcome her with open arms. She’d have a new home. A new life. But right now, the girl wasn’t even slightly aware of any of it. And still, she seemed content. If that wasn’t going to give Hallie the reassurance she needed, nothing was. She’d done well. She smiled, deciding to head outside to join the kids. Hallie wasn’t the only one watching the children play from the distance. Ever since meeting the orphans during the Snowflake Day festivities, both Hope and Aslan started to spend time at the orphanage. Hope dove straight in to playing with all of the new friends they’d met. She couldn’t quite understand why her cousin kept his distance. Aslan, in the meantime, observed. Observed Alexus, that was. He just couldn’t make any sense of it. Watching her play horseshoes with Donnie, she seemed like any other kid he’d met. But he knew that wasn’t quite true. Should he approach her directly? See if she somehow blows her disguise? The boy was at loose ends. “Hey Aslan,” the girl waved at him with a smile. Plummity plums, Aslan thought, jumping back. Had she read his mind? He knew from aunt Peyton that aliens were capable of that. Was Alexus really as friendly as she’d like everyone to believe, or was she just playing a game and seeing right through him? He wasn’t going to risk it. Alexus frowned. Aslan wasn’t sure if she was onto him or if she’d bought the distraction. She couldn’t know he was interested in her, right? Who knew what aliens in disguise could do? “Suit yourself, kerbal!” Alexus said angrily, storming off towards the monkey bars. Their confrontation was over by the time Hallie’d gotten to the garden. All she’d come to was a bunch of children playing horseshoes peacefully, though she did notice Alexus sat way aside from the others. Than again, that didn’t surprise her. The girl liked to seek company. She took in the view, feeling content. The days when she’d been lost seemed so far gone. Today and every day, these kids mattered. Her life mattered. What could be better? It took her a while to notice the man reluctantly making his way towards her. “Oh. Um… hi.” She stuttered over her words at the sight of Larobb. She’d heard about him from time to time over the years, of course, but they’d never really spoken to each other since that awful night back in high school. From what Vito had said though, it seemed like Larobb was doing well for himself. That he was happy. And Hallie was pleased about that. Though there was a strange part of her that had a hard time accepting her once-upon-a-time best friend was no happy with his life, without her in it. And now he was stood right in front of her. She wasn’t quite sure what to say. “Should we sit down?” Hallie gestured towards the camp fire seating area. Surprisingly, Larobb’s face actually lit up at the mention of his girlfriend. They’d been going out for a while now, but Alyssa always found a way to surprise him. Larobb had never met anyone like her. It was the first time he’d ever felt quite as serious about a relationship. “Babe, I was wondering… what if I moved in?” He blurted out one night. “You what?” Alyssa broke off from the kiss. “Well, it seemed like the next natural step. We’ve hardly started dating yesterday. I’m here most of the time anyway. Aslan likes me. And I’m pretty sure you do, too.” Larobb attempted a joke. Alyssa tried her best not to get flustered by his proclamation. They had both been careful not to use the L-word with each other, until now. Hallie looked at him, wondering what it must have taken for him to become this whole new person. Neither of them said anything else, but they were both beaming. Hallie noticed the sun had set while they were talking, she lit a match, starting the camp fire to warm them up in the winter night. Years ago, their friendship ended by a fire pit. Dying fire, dying relationship… She thought he was gone for good. That they’d never speak again. And for the longest time, it seemed that would be the case. But looking at the newborn flames right beneath her feet, it appeared that perhaps, nothing was ever gone forever. “Destiny,” The woman smiled flirtatiously. “The name is Destiny. And I’ll definitely make sure to come along for the next class. I do like a good workout, especially when it involves stretching.” She winked. Lorcan couldn’t get away fast enough. Destiny didn’t seem quite done with him, pondering her next move, but as soon as Lorcan escaped the exchange, it left his mind completely. He smiled to himself, watching Sera finishing up her routine. “The class is over,” he said to her gently. “Are you trying to score brownie points with the instructor? You do remember that’s just me, right?” He joked. “Sure, sounds good.” He smiled. “I hope they had a good time,” Sera nodded. “It was too hard to keep track of everyone! I don’t know how Hallie does it… Anyway, how was your Snowflake Day? I missed you over the break.” She blurted out before she could stop herself. “I missed you too.” He agreed. Sera stopped in her tracks. “Don’t worry, it was just another day to me. You know what I do celebrate?” Lorcan asked, trying to make her feel better. “I do.” He didn’t sound too sure. Sera wondered who he was trying to persuade, was it her or was it himself? She dashed off. She needed a moment to compose herself. Lorcan didn’t move for a while. She was coming with him. Was it a mistake? It probably was. It definitely was. But… a hopeful smile found its way to Lorcan’s face regardless. Alexus was drumming with her fingers distractedly when Hope found her in front of the restaurant. “How… how did you know?” Alexus looked alarmed. She jumped up, trying to walk away from Hope. Alexus seemed to be struggling with her emotions ok.
“I’m not mad at you, Hope. And I’m sorry too. I just… need to be alone for a while, ok?” Alexus said as calmly as she could manage. Hope mopily made her way back to the restaurant. She failed. Alexus was still sad, and she couldn’t figure out why, or how to make her feel better. Alexus wasn’t the only one seeking solitude outside. Away from the party, Leo stood on the back patio, looking into the horizon. Vito studied the wrinkled face of the man in front of him. All his life, he’d known his parents to be inseparable. Vito rarely thought of one of them independently of the other. 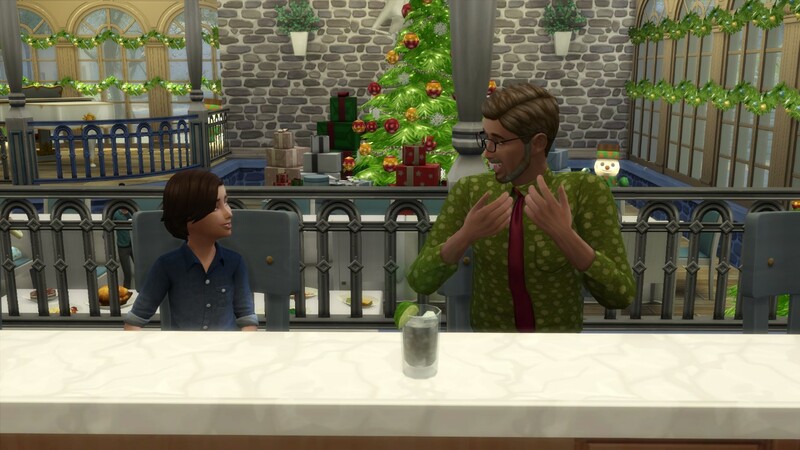 They were the loving couple that raised him and his sisters, that wanted the best for them, and the best for Newcrest. “Dad… how did you feel about none of us carrying on your last name?” He asked carefully. Leo gave him a funny look. His father looked so old and fragile in front of him. Vito spontaneously hugged the man. Leo smiled at his son, misty-eyed. The two men didn’t want to prolong the emotional moment, so they headed back inside. Leo’s chest was filled with pride. Vito was right. He was the living proof that he’d left a legacy behind. Leo had raised a good bunch of kids. The restaurant, that was just a cherry on top. When they walked in, Leo spotted Aslan kicking into the bar, pouting. Leo watched him, not saying anything. “I didn’t mean to break anything… But I break everything. Why do I always do that?” The boy asked. “I think you’re not talking about the counter anymore, are you?” Leo smiled. This was way more than Le had bargained for. Leo’s wife was talking to a whole other set of kids in the meantime. “So, you’re a half-alien, right?” Donnie was checking if he understood it all correctly. “So, wait, was your alien mom the same alien that was Peyton’s?” Donnie asked. “Err, no… it’s a little complicated.” Pauline didn’t particularly feel like going into detail. Pauline was lost for words for a moment. Not that this was particularly news, she’d known all the children were orphans, of course. But that didn’t make it any easier. “I’m sorry too, Donnie.” She simply said in the end. They can also hate, she thought. But this was not the day for getting into that. “Grandma and Peyton don’t use disguises!” Hope reminded hm. “No, but you can, right?” The boy turned to Pauline. “What about your mom?” Donnie could help his curiosity. “Why was she hiding?” Hope asked. “So, did she look just like a human in her disguise? How would you even be able to tell if someone’s an alien then?” Donnie pondered. “How?” Hope was interested now too. “Hey… dad.” Aslan dragged his feet towards Vito. “There you are! It’s not like you to hide away from the spotlight.” Vito noticed. “Well… I didn’t want to make even more of a mess.” Aslan sighed. “Do they always forgive you?” Aslan asked. They weren’t too hard to find, both Donnell and Hope were listening to Pauline’s concerto. Aslan watched them from the distance for a while. You can do this, he told himself. Remember what dad said. He took a deep breath. “Hi, guys.” He said awkwardly. Thankfully, Aslan’s audience wasn’t a harsh one. “Oh, in that case, we’re friends again.” Hope smiled. “Really?” Aslan asked, scared to believe that things got fixed so easily. “Yeah. Just be nice, from now on.” Hope said simply. “It’s simple.” Hope repeated in her grandmother’s words. “They glow!” She and Donnie finished in unison. Turned out he might know the most about aliens in disguise out of the three of them. Leo couldn’t help but grin at the sight of the last dish he’d prepared. After hours and hours in the kitchen, the feast was finally ready. “The kids would probably prefer it,” Leo laughed. No time for that now! The guests had already started arriving. “Grandma!” Hope rushed towards her, stretching her arms out. Pauline pulled the little girl into a cuddle. “How’s Hopey-bug?” She asked her. “Pretty awesome.” Pauline smiled softly. “Oh, and there’s presents too! Eeep!” Hope ran off excitedly. Pauline and Leo giggled at the sight of her. “Your kid is too cute.” Sera told her sister. “I just want to steal her!” She joked. “You’ll have one of your own someday,” Carly smiled. Aslan was sitting right beside them, but he had way more interesting things to focus on than eavesdropping on the grown-ups’ silly conversations. The girl next to him was glowing. And not in the figurative sense of the word. Was he imagining things? Had nobody else noticed? “HI! I’m Alexus!” She introduced herself with a smile. He didn’t have much more time to mull it over, the girl’s pinkish glow subsided as everyone gathered around the table for their meal, squeezing tightly around the table. Carly’s couldn’t help but trace back to her conversation with Sera. Seeing all these little kids about made her mind raise. A part of her wanted to give them all a new home – but what would be the point of that? Hallie had already done that, and far better than she could in her own house. But with Sigrid’s cute smile, Eun’s clever remarks and Marla’s tomboyish ways… how could she resist the urge of welcoming another child into her home? And seeing how excited Hope was, and how good Ralph seemed at entertaining all the little ones certainly didn’t make it go away. But her sister was right. Adopting one of them and having the others live just around the corner, witnessing what could have been their life so close they could almost reach it… it seemed cruel. Carly shook her head. It was a silly thing to think about. The children had a fantastic life with Hallie. Sera blushed a little. “I don’t know. He’s a bit of a closed book, even now. Maybe I should set you up with him, since I’m clearly not getting anywhere and you think he’s hunky…” She joked, deflecting. “Haha, very funny! Nah, I think I’ll be kind and let you keep this one.” Vito teased her. “Who are you and what have you done with our Vito?” Hallie chimed in, overhearing the conversation. “If only!” Carly called out to him across the table. Yenn beamed, looking at them contently. 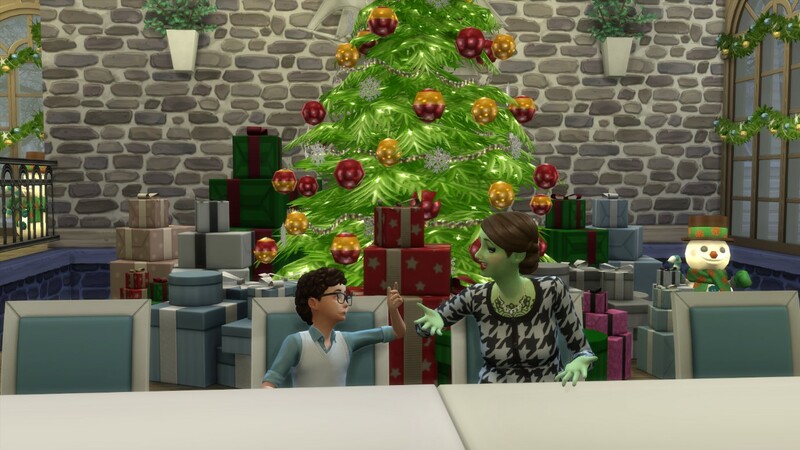 She never thought she’d see the day when all the four heirs would get along so well, sitting around one table and actually seem happy about them. They all still had their own troubles to face, but now they had each other. But these kids, they got it right, Yenn thought. Yenn was brought back to the present with Peyton’s unmistakable voice resonating through the room. Her and Pauline then headed for the bar giddily. It had been a while since the two sisters had a chance to catch up properly. But no matter how long it had or hadn’t been, no matter how busy they were with their own lives, the two of them would always lip right back into their old ways, as if they’d only just seen each other a moment ago. Their friendship was one of those that you could pick right back up at any time, right back where you left off. Far from subtle, the presence of the two bubbly green-skinned women hadn’t escaped any of the orphans. Donnell was barely listening to them. Eun and Millie were the two kids he went to with his alien grave discovery after Alexus had shrugged it off. And they didn’t believe him. Alexus didn’t believe him. Clearly, they were all wrong. If there were two aliens already living in Newcrest, out in the open, how many more were hiding around, going unnoticed? “Hey Donnie, is your head in the clouds again?” Camden nudged the boy. Camden frowned. Getting lost in airy-fairy stuff like Donnell was not his thing. He liked to play in the mud, and see what was in front of him. “Whatever, point is Donnie is a looney!” Camden burst out. “Yeah, not everyone can be cool like us,” Aslan nodded with his mouth full. “I think Donnie’s cool!” Hope jumped in. “Thanks Hope!” Donnell’s face lit up. He’d never been described as cool in his life. “Don’t flatter yourself, Hope thinks everyone’s cool.” Aslan shot his confidence right back down. Donnell buried his face in the palms of his hands. Hope started to open her mouth to scold her cousin – she knew most people couldn’t handle Aslan’s harshness – but Camden beat her to the punch. “Oh, you think you’re the best thing in the world, don’t you? Just because your family owns this restaurant doesn’t mean you’re better than us! There’s seven of us and only one of you, we can take you on!” He said to Aslan angrily. “My family owns the whole of Newcrest!” Aslan hissed. Aslan watched them all be stupidly mushy for a moment. “You’re all lame!” He rolled his eyes, walking away. Ralph and Carly had been watching the children. “We’ve got such a good kid.” Ralph grinned proudly. “I think luck has nothing to do with it.” Ralph looked at his wife lovingly. Unbeknownst of her parents’ plans, Hope’s mind was preoccupied. She found Donnell by the entrance. “Hi, Donnie! I just wanted to check if you were ok?” She approached the boy. “Oh, you want to talk to grandma or her sister? Great aunt Peyton is right there!” Hope pointed at Peyton. “What’s up, little one?” Peyton joined them. “Donnie here really wanted to meet you.” Hope gestured towards her new friend. “Well, hello there, Donnie.” Peyton smiled at the child. “He finds it interesting that you’re an alien.” Hope said helpfully. She was going to stick around for longer, but her husband Grady called her over. He noticed a rather upset looking Alexus standing next to them. “Don’t worry Alexus, I don’t really think there’s an alien in disguise in the room!” He tried to cheer her up. “Yeah, grandma is a half alien, and aunt Peyton is a total alien, but nobody else in the family is.” Hope added. She turned around and ran towards the door. “It’s ok. I’ll go talk to her.” Hope offered. “Thanks Hope!” Donnie said gratefully. Hope did a little twirl.